Last year 280 turnkey and for rent apartments were built in a municipal project called Snabba Hus, situated in Stockholm’s southern Västberga district. Svenska Bostäder, a company owned by the city and, at the same time, one of the biggest Swedish residential developers, completed the development in the summer of 2016. According to the objectives of the project, people between 18 and 30 years old will be able to rent their first studio here for about EUR 500, which is not expensive. “These people belong to a group that doesn’t have the money to buy property. That’s why we should help them,” is how a representative of the investor describes the objectives of the programme. And the Swedish press claims that around 300,000 flats are desperately needed “right now”. The fast rate of construction is one of the main reasons for employing modular technology in this case. “It is great for us to build a high quality project in one third of the regular construction time,” claims Andreas Martin-Löf, the architect of Snabba Hus, who has also completed other prefab projects and in 2014 won the prestigious Architect of the Year prize awarded by Swedish magazine Residence. Ready and furbished apartments arrive on the construction site. They contain a bathroom, a kitchen annex and some basic furniture – all manufactured in the comfort of a factory. The main task on the site is to position the modules onto a previously prepared scaffolding made of reinforced concrete, which looks a little like a wine rack, and build staircases and lifts around the newly-constructed building. After connecting up the water and electricity, the modules are ready for occupancy. The containers have a minimum carrying capacity and hold only their own weight. They are made of light materials, such as composite panels (filled with insulation). The modules have an area of 32 sqm and each weighs around 9 tonnes. “Their size makes it possible for us to transport them in lorries on public roads,” explains Andreas Martin-Löf. They do not have to travel far, only about 2.5 hours from the factory in the town of Kungsör near Stockholm. Swedish company Junior Living is the general contractor and producer of the modules. As the architect says, social issues lie behind the project. “Our orders create a local labour market. We haven't accepted offers from Chinese manufacturers, even though these are on the increase,” explains Andreas Martin-Löf. Not all investors, including Swedish ones, follow similar selection criteria, mainly to the advantage of producers from Central and Eastern Europe and the Baltic region. As a producer of wooden modules and a contractor, Unibep implemented its first project in Scandinavia in 2009. “It was hard at the start, since we were an obscure Eastern European outfit with no local contacts and a brand name unknown to the Norwegians,” recalls the president of the board of Unibep, Leszek Gołąbiecki. Now Unibep has constructed almost 1,600 modular apartments in Norway and more than 300 are under way. Its projects have been implemented in Oslo, Stavanger, Ålesund and Trondheim, as well as in Tromsø near the Arctic circle, among other locations. The company has also broken ground in Sweden, too. In January it signed its first contract for the production of twelve apartments in Skene near Gothenburg, with the general contractor Tuve Bygg being the ordering party. Its success in Scandinavia encouraged Unibep to set up a development joint-venture with Norwegian company Gemich in 2013. Unibep has a 50 pct stake in the business, called Seljedalen, and constructs modular buildings through the company. 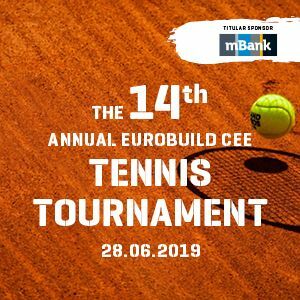 “Such a business model is extremely beneficial to Unibep because we can make a profit first out of the construction and then out of the development,” explains Leszek Gołąbiecki. Between November 2015 and November 2016 the company constructed three buildings with 39 apartments in Stjørdal near Trondheim. At the end of 2016 the company started the construction of 106 apartments in the same region of the country, in Melhus. In 2016 the Bielsk Podlaskie based company generated PLN 156 mln in revenue from the modular construction sector, which is PLN 18 mln more than the previous year. And were it not for exchange rate fluctuations, this figure could have been even higher. The prospects in Scandinavia are so promising that in 2016 the company completed the construction of a new production hall in Bielsk Podlaskie, which increased its production capacity from 700 to 900 modules per year. The small village of Topole located near Chojnice in Bory Tucholskie (in the Pomeranian province) is quite busy, too. A factory in the village produces modules for the construction of hotels in New York, Amsterdam and London. This year two high-profile opening ceremonies of hotels in New York are due to take place, which Polcom Modular, a family company set up by Eugeniusz Słomiński, has contributed substantially to. Dutch chain CitizenM is opening a hotel on Bowery Street in Manhattan, and with 19 floors and 300 rooms it is to be the biggest modular hotel constructed so far in New York. All 210 modules have been shipped from Poland. The choice of the company as a contractor was not a random one. As a hotel developer, CitizenM has been working with the Polish producer for a few years. The first hotel by Polcom Modular – CitizenM Bankside in London – was built in 2012. Last year the Polish modular producer played its part in the opening of two new buildings belonging to the chain in London – CitizenM Tower of London and CitizenM Shoreditch, and in the extension of one at Schiphol airport in Amsterdam. Currently the Dutch chain is working on other hotels in Paris and Shanghai, among other locations, and if you follow the social media, you can guess that Polcom is also involved. The company is also providing modules for hotel projects by the Alt hotel chain to be constructed this year in Canada – two in St John’s and one in Calgary. As well as the previously mentioned CitizenM hotel in the city, a Pod hotel is being constructed in Brooklyn in New York, which will be opened in the next few months. The Pod Brooklyn hotel, consisting of 249 rooms, has been designed by specialised local studio Garrison Architects, while New York-based company CBSK Ironstate is the developer. The choice of a Polish producer caused quite a stir in the New York press, mainly because of the renown of the local modular industry (several large modular projects, mainly of a residential character, have been completed in New York in the last three years). According to New York real estate magazine The Real Deal, the Polish manufacturer won the contract after impressing the American developer with its experience with luxury hotel products (Polcom supplies ready turnkey hotel rooms of a suitable standard) and the price offered compensated for the shipping costs. Interestingly, the Chojnice-based producer is now preparing two Courtyard Marriott hotels, but this time as an investor – one in Edinburgh and another near Luton airport. 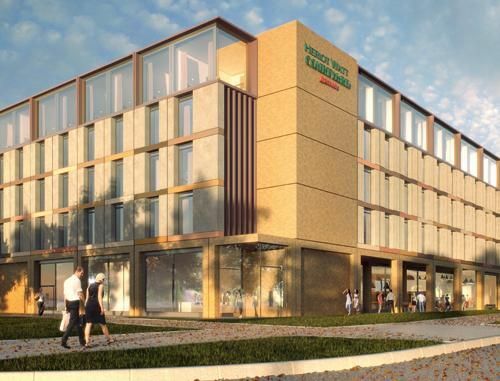 These are to be the first Courtyard Marriott hotels developed using the modular system – and will also mark Polcom’s debut as a property developer. Why are there no similar projects in Poland? “There are three reasons. Firstly, the price,” explains Jakub Gałka, the commercial department director of Northus, which is also based in Bielsk Podlaskie and has completed 22 projects, mainly on the Scandinavian market. “Most of the finishing work, such as on the floorboards, tiles and installations, costs PLN 15–20 per hour in Poland, which makes it more financially viable than in Norway or Sweden, where the costs are PLN 80 per hour,” explains Jakub Gałka. However, when the modules are supplied to the Polish market, the competitive edge disappears and the costs are similar. Moreover, Scandinavians have a penchant for simple forms. And, according to Jakub Gałka, modular buildings fit into their aesthetic visions, whereas Polish people prefer more complicated projects. Another issue hangs over wood as a raw material. In contrast to Poles, Scandinavians have never discarded wood in favour of reinforced concrete. “A wooden house in Scandinavia is a symbol of eco-friendliness and being close to nature – not of being poor. It’s a symbol of Norway. They have known and used wooden technology for ages, so there is no need to convince them about it,” adds Leszek Gołąbiecki of Unibep. He also reassures those who are unconvinced about wood that there is no threat of potential fires. “The wooden skeleton is covered with fireproof building materials. Wooden modular buildings have better soundproofing than brick ones and are very durable at the same time,” claims Leszek Gołąbiecki. They are also eco-friendly. He gives the first passive modular building constructed by Unibep in Trondheim as an example. Jakub Gałka insists that even though the construction costs for modular buildings are comparable with traditional methods, residential developers are still not so keen on employing this method to reduce the time of completion. “It is more important if and when the apartments will sell, and this wouldn’t be so clear for modular buildings in Poland,” he says. However, buyers’ attitudes are expected to shift. “People are increasingly choosing to have prefabricated detached houses. In time, prefab houses, particularly modular ones, should be embraced by Poles as a method for multi-family construction, too,” claims Jakub Gałka.